Remember the crazy 80's and nostalgic 90's cartoon classics? Of course you do! You'd race home from school, toss your denim backpack and Lisa Frank binder to the side, crack open a Sqeeze It, and tune in just in time to sing along to another hair raising adventure with Huey, Dewy and Louie in Ducktales! 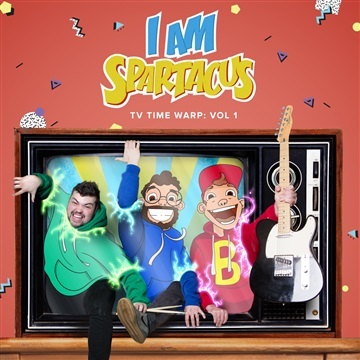 "They don't make 'em like they used to..." Pop Punk outfit, I Am Spartacus is on a questto put a twinkle in your eye and a reminiscent smile on your face as you listen to 5 of the most popular TV theme songs from the greatest era in animation history. "We're the Chipmunks" kicks off this sure to be modern classic EP with the familiar synth riffs and big guitar leads that made those 3 chipmunks rock stars. Throughout the album, IAS tips a hat and gives a steady nod to many of the elements that made each of these songs a classic: "Ducktales" famous bouncing slap bass line intro, "Ghostbusters" smooth synth breakdowns, soaring vocal harmonies and modulations in "Rescue Rangers", and of course the wacky sounds and doo whop influence from "Muppet Babies". After 7 minutes of nonstop nostalgia, we're positive you'll be craving a bag of Bugles while looking for the repeat button. Look for the official release of TV Timewarp: Vol 1 by I Am Spartacus this summer!